Hanford, California is a relatively small San Joaquin Valley town that became a destination for gourmands seeking the Chinoise cuisine (a fusion of Chinese and French cooking) of third-generation Californian Richard C. Wing at his Imperial Dynasty restaurant. For nearly fifty years, a long list of celebrity diners including Walt Disney and Bing Crosby flew to Hanford just to eat there. A cadre of New York attorneys flew to the restaurant four times a year. Many groups traveled frequently from the Bay Area, Fresno and Southern California by car or train in a gastronomic pilgrimage to this creative restaurant. I loved dining there so much that I made the four-hour drive with friends from my home in Orange County to eat there at least three times a year over a twenty year span. 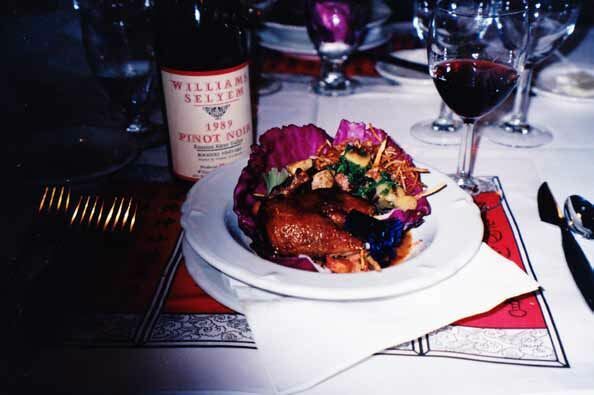 Perhaps even more implausible than the exalted culinary tradition established by Richard in Hanford’s China Alley, California’s first Chinatown, is the fact that the restaurant had a distinguished wine cellar housed in a former opium den that held some 60,000 bottles and a Wine Spectator Grand Award winning 1,100 entry wine list. 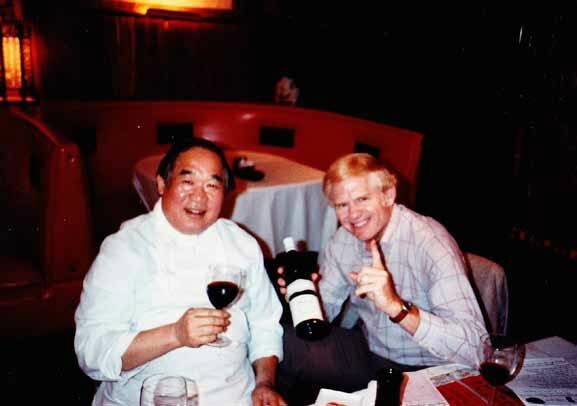 Richard’s brother, Ernie, was instrumental in establishing the early reputation of the Imperial Dynasty wine cellar. 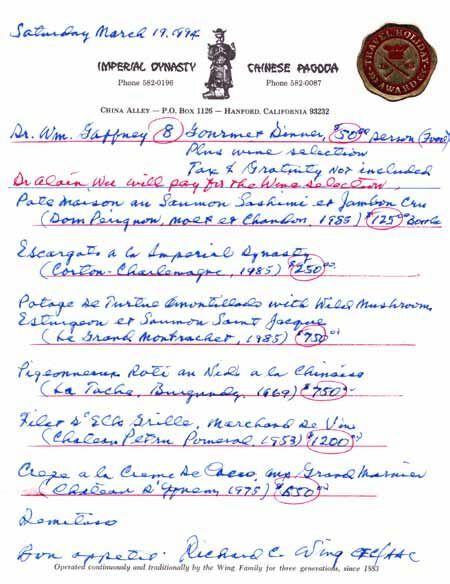 As a knowledgeable wine buff, Ernie introduced the restaurant’s wine list in 1957, and soon filled the Imperial Dynasty wine cellar with collectible California wines from Beaulieu, Charles Krug, David Bruce, Freemark Abbey and Heitz Cellars, and French wines from Domaine de la Romanee-Conti, Petrus, Lafite, Mouton, Latour and Haut-Brion. When possible, Ernie would typically age the restaurant’s wines for four or five years before putting them on the wine list so they could be enjoyed at or closer to their peak. Although Ernie died at a relatively young age in 1972, Richard maintained the extensive wine cellar. He tasted wine regularly, and the proper marriage of food and wine became his passion. Richard knew wine and how to match wine with his cuisine, but like many of his varied talents, he always downplayed his expertise. The Imperial Dynasty was the first restaurant account for both Hanzell Vineyards and Stony Hill wineries, and one of the first restaurant accounts for several other iconic Napa Valley wineries including Heitz Cellars and Caymus. 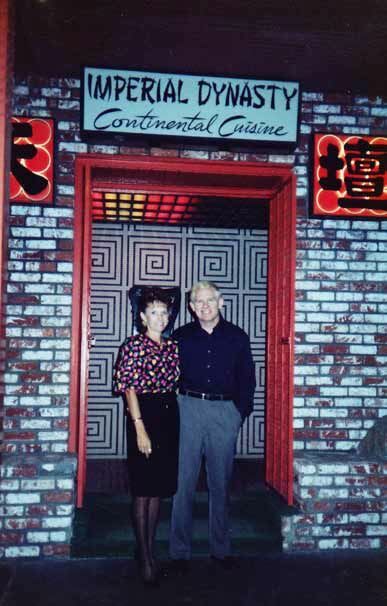 Although the restaurant had a “regular” menu of ala carte Continental and Chinese specialties, out-of-town diners opted for the gourmet prix fixe menu arranged by advanced reservation. The gourmet menu consisted of six courses, accompanied by appropriate wines for each course suggested by Richard. The menu was hand written by Richard for every table each night. 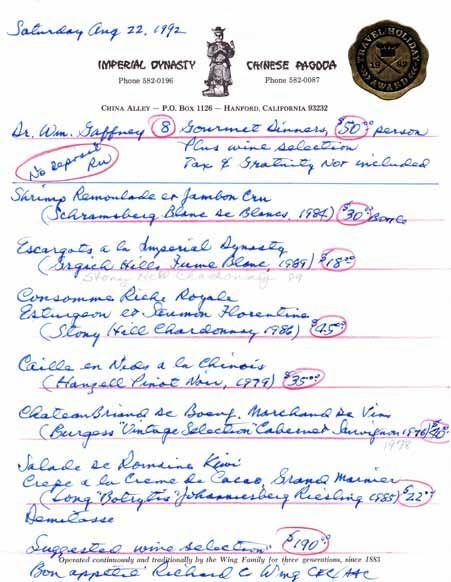 A copy of a gourmet menu from dinners I attended in 1986 that included Hanzell Chardonnay and 1992 featuring Hanzell Pinot Noir are reproduced below. A tour of the wine cellar always preceded dinner, where diners could search out gems to accompany their dinner or augment Richard’s selections. Prices for wine and food were extremely reasonable by usual restaurant standards of the time. 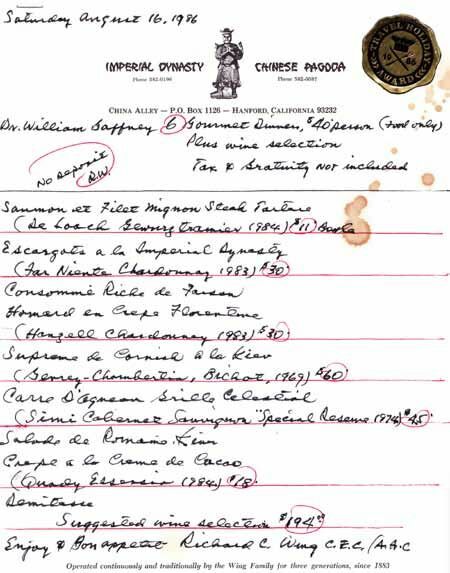 Richard had a captivating sense of humor, and as a joke, he penned a menu for me in 1994, with a note that my good friend, Alain Wu, would pay for the wine selection. We never partook of this menu and wine selection, but it shows that Richard knew of great wines. Sadly, the Imperial Dynasty was never sold upon Richard’s retirement, perhaps because his was an impossible act to follow. Finally, after manning the stove at the Imperial Dynasty for almost fifty years, Richard retired at 85 years of age and the restaurant was shuttered. Richard passed away at 89 years of age in 2010. I have often reflected on the many times I spent at the table with him, touched by his unwavering devotion to his profession and his ebullient personality. He called himself a “humble Chinese chef,” but he was highly venerated by his family and a cadre of culinary devotees alike. The photo below shows me in my younger days with my lovely wife, Patti, who patiently endured the many bacchanalia's we attended at the Imperial Dynasty. For further reading: Noodles through Escargots, Arlanne Wing and Steve Banister, 2011.